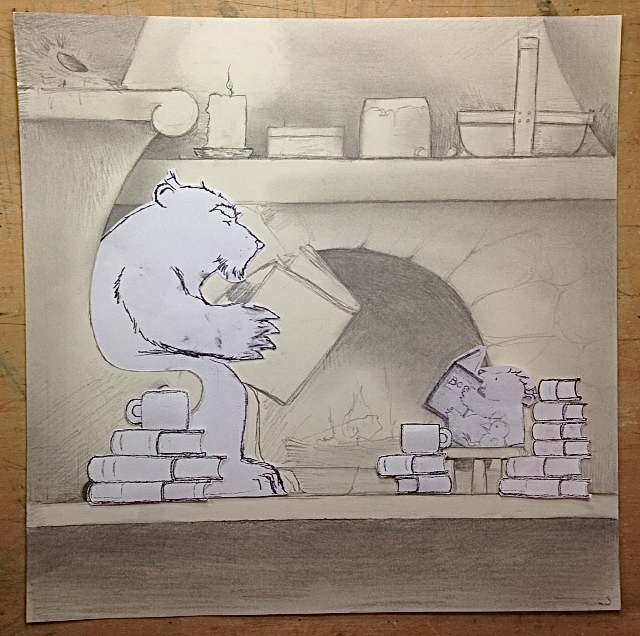 Slowly, but surely, the finished illustrations for A BED FOR LITTLE CUB are getting done. The book and pictures are starting to take on a real life of their own. Getting off to such a slow start always brings to mind one of my favorite quotes that I came across about 40 years ago. It really does sum up my feelings toward illustrating. It can take me an inordinate amount of time to get started, really get started, on the finished illustrations for a book. The writing part comes easily enough (perhaps I am a more confident writer than I am illustrator) but when it comes to cutting the watercolour paper, laying out the crop marks, pencilling in the composition and then start painting…can take me forever! I will admit that once I have broken through the fear of the unknown the painting generally goes well and is actually quite enjoyable. Just so long as I don’t torture myself and worry about making mistakes! Someone once told me that I am a perfectionist living in a imperfect world and it’s slowly driving me mad. I’m almost there. Being mad, that is. I am happy to report that so far I am pleased with the finished pieces for the book on the drawing board. I’ll try to take some decent photos before I take the art down to NYC and not see it again for a year or so. 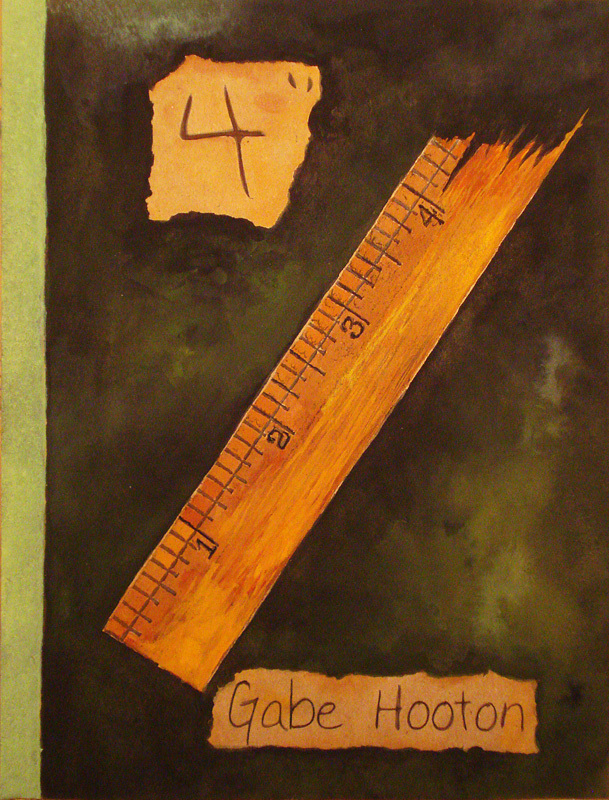 Meanwhile…if you’d like to check out a non picture book that I wrote (and did the cover illustration for) go to amazon and look for: 4″ by Gabe Hooton. This edgy coming-of-age novel is based on my own journal that I wrote when I was 17 years old. It will give you some insight into how my muddled (at times) brain works. 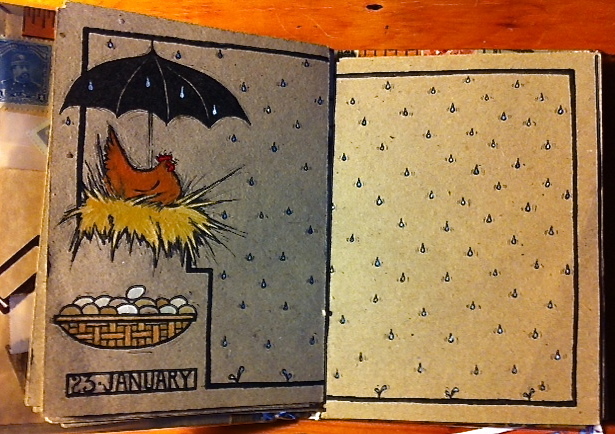 4″ is written under one of my pseudonyms to avoid confusion with my picture books. Besides, Gabe has his own voice as a writer. Where did the word “Moel” come from? It’s a fairly straightforward answer but the evolution and how the word came to define both my writing and illustrating is unchangeable. I used to be a secretary/administrative assistant/office manager and have sharp typing skills. I still type 110 wpm to this day. But, sometimes my fast typing does make for mistakes. And that’s where “moel” came from. I was trying to type the word “mole”. When I saw the typo I liked it so much that I kept as MY word. And I named my studio Moel Eyris Studio (at Henwoodie). Eyris is MY word for “Island(s)”. Over the course of doing research in archaeology and prehistory (of Scotland) I came across another very interesting word: moudiewart — which is the archaic Scottish word for “mole”. If you look up moudiewart in the OED you will find a fascinating array of definitions. The most profound being: moldo warpo that translates literally as “earth thrower” (a mole). Naturally, as a writer, I took the etymology of these words to heart and they became the core of my own mythology: THE LAY OF MOEL EYRIS: The Saga of the Bear’s Son. I created an entire history for my word “moel”: mool, maol, moel, and so on. I like to think that “mool” is the most archaic in the etymology of the word ‘moel’. And, of course, I created my own definition for the word. The most interesting definition is for the word “maol” — it means “mythographer” (not mole). In my mythology moles and mythographers play the most important roles in the narrative. Many geographical place names on the Myvyrian Map of Moel Eyris are derived from “moel”. Here are some examples: Moel Terre (Mole’s Earth); Moel Weorpe (Mole’s Worth); Mowdie, Moudiewart, Moel Faulds; Moel Breeks, Mools Wadder; mool dykes; Moolstery; Cymry of Maols, and so on. 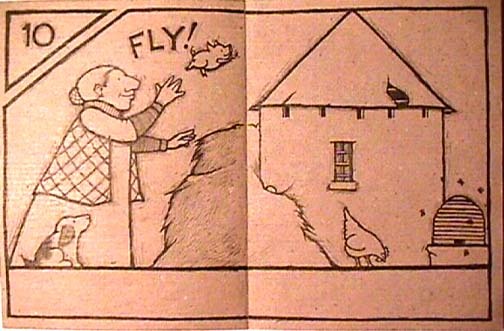 In my mythology the actual animal, a mole, is most often a “scupper” or messenger (for maols). So, from one simple typographical error sprang an entire mythological world in which nearly all my stories and illustrations are set. The narrative is firmly rooted in more than thirty years’ research delving into the prehistory of Scotland, the Orkney and Shetland Islands, the Outer Hebrides, St. Kilda, and, of course, The Flannan Isles. I wanted to create (write) my own world in which magic was real and based on fact, not wand waving fiction. Words have power. Throughout history this has been proven time and time again. Just think of that old adage: The pen is mightier than the sword. It’s very true. THE LAY OF MOEL EYRIS (from now on referred to as LOME) tells the story (and history of a mysterious and real archipelago that is neither “here nor there”. 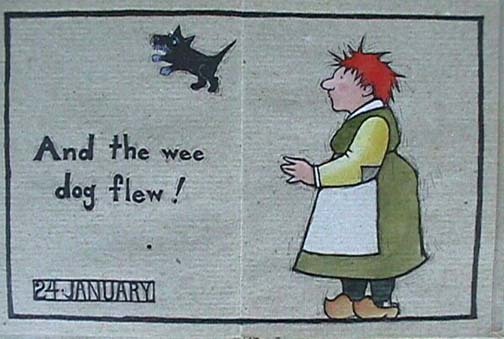 It is betwixt and between the two Realms of Man and Faërie. The inhabitants of these islands are diverse and have fascinating stories of their own. The fates are intertwined, their destiny is unstoppable. Their beliefs are unshakeable. To go back a wee bit farther in my own evolution as a writer I would have to tell you that 1) I have always been an avid reader and that 2) it was when I discovered the writing of J.R.R. Tolkien that my life was changed forever. I became obsessed with “barrows” and “barrow-wights” and when I looked these words up in the OED it became imperative that I visit England and Scotland and see these remarkable ancient structures for myself. Note: IF you look up the word “barrow” in the OED it will refer you to such words as “cairn,” “tumulus,” “burial mound,” etc. My quest to explore cairns and barrows myself began in 1978 with an extended eight week expedition (sounds so much more interesting than “trip”) to Scotland. And then onto the Orkney Islands, across the north coast of Scotland (hitchhiking and hiking) and taking the ferry from Ullapool to Stornoway in the Outer Hebrides. I must say that I was NOT disappointed in the sites I explored. My imagination was set on fire and the more I saw and explored, the more I read about these ancient sites, and then began to read (and hear) the legends and superstitions associated with them, my work and writing would change forever. 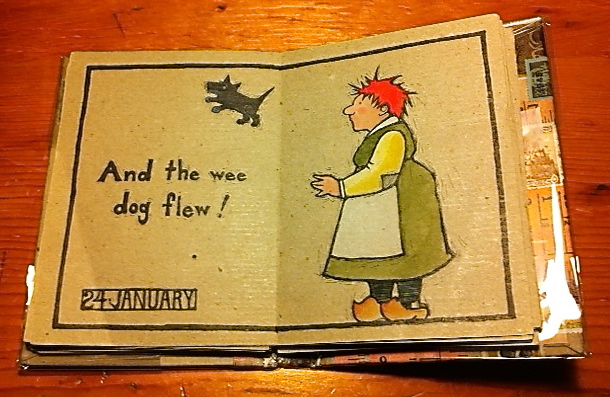 If you go back and look at one of the very first picture books that I wrote and illustrated you will see how profoundly archaeology and folk beliefs influenced my writing and illustrating. RAVENA (Holiday House, 1983) was the first children’s picture book that shed light on my fascination with cairns, standing stones, bean sidhes, bog trotters, etc. My own mythical world of Moel Eyris began to take form. 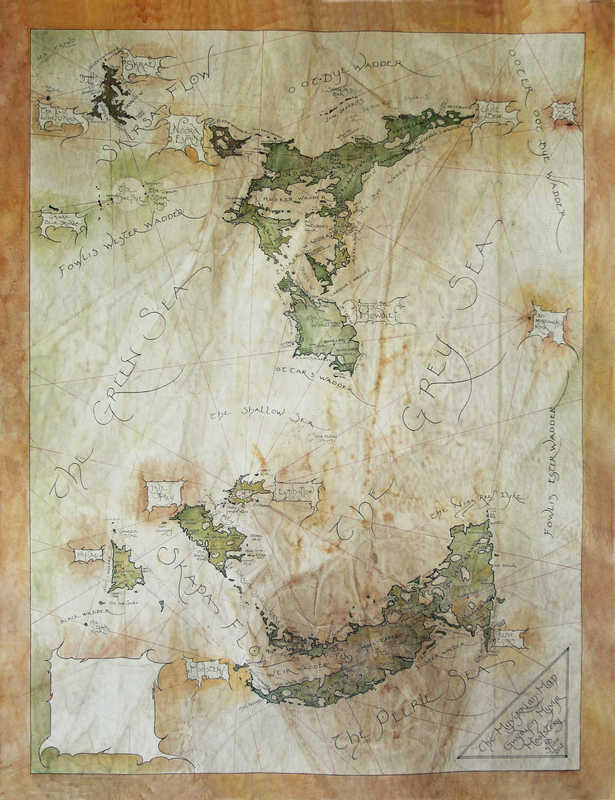 Throughout my career as a professional writer and illustrator I have made detailed maps, architectural plans, sections, elevations (of farm buildings, cairns, Moolstery et al) and have kept thousands of pages of detailed notes on the flora and fauna of the islands, the inhabitants (how they came to be there and how their lives evolved), the history, the magic and the mystery of these islands—in short, Moel Eyris became MY world. 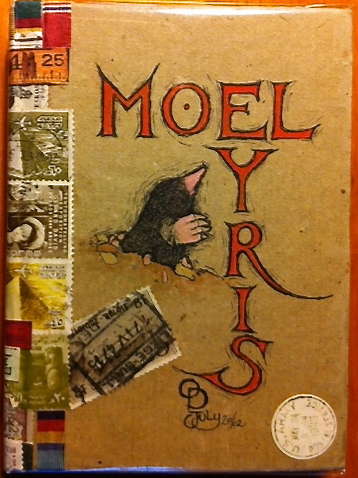 As this blog evolves (you notice that there is a lot of evolving in my life and work) I will share glimpses into the world of Moel Eyris and will begin to outline who is who and what is going on in their life (or death). As I work on the illustrations for picture books that I am obligated to finish it is very difficult to NOT think about, not write about, Moel Eyris—the Islands on the Edge. 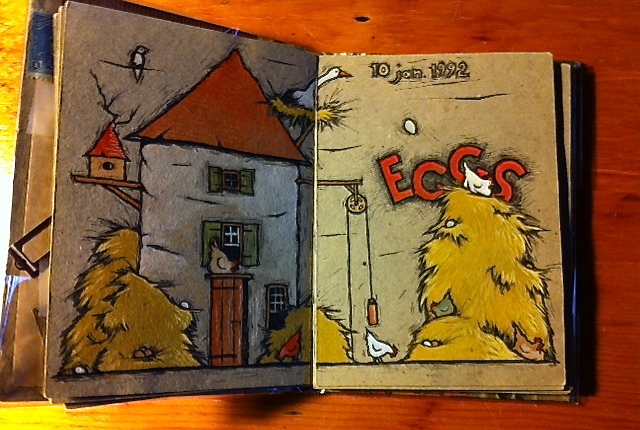 Back in 1992 I kept a sketchbook where I drew ONE picture every day. It was an exercise to try to become a more confident drawer. 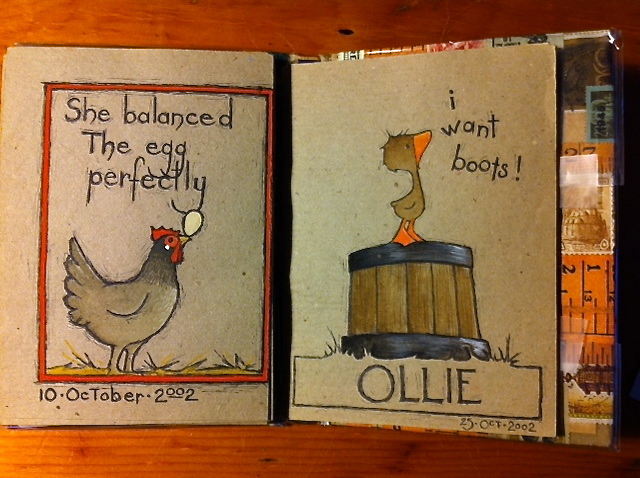 The sketchbook is 5″x7″ or 4″x6″ (I’ll have to measure it). It’s quite small. 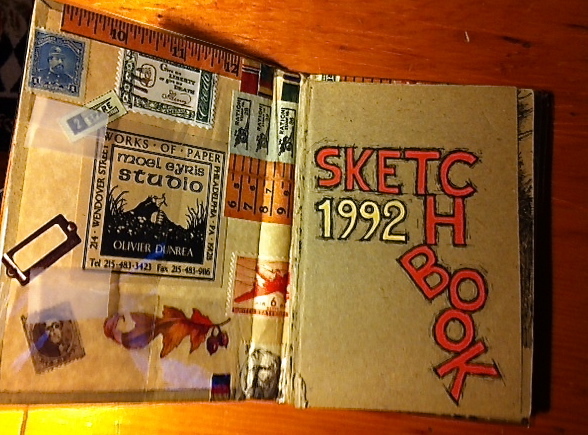 Many of my book ideas came out of this sketchbook and others like it. Sometimes I added a few words to record an idea or thought that added humor or insight into the picture. As both a writer and illustrator a book idea often starts with a sketch. 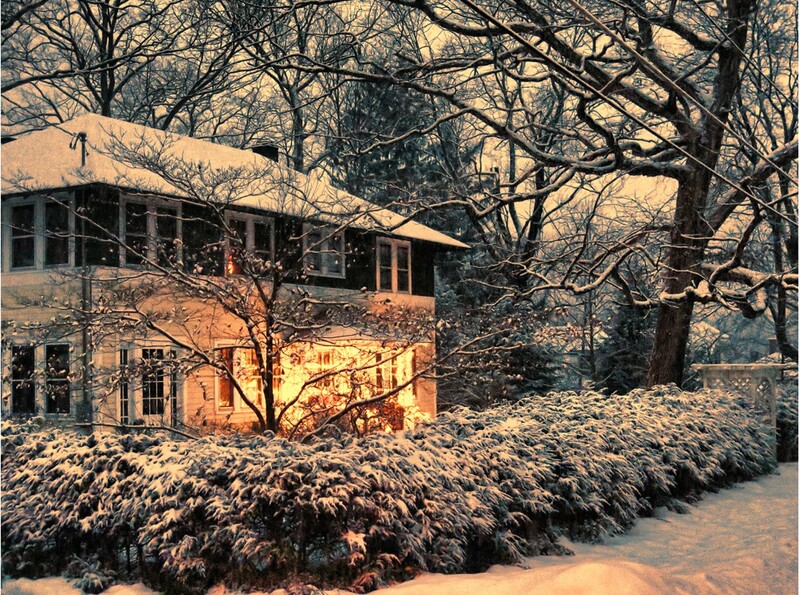 Then the words come and the two merge together to begin to tell a story. Today is the day that magic happens! Today is the day that magic happens on the drawing board! Writing is definitely easier than illustrating. No doubt about it! I don’t struggle with words the way I struggle with pencil and watercolour brushes. Even after all these many years of writing and illustrating books for children I am still intimidated by a blank piece of watercolour paper and terrified of making that first fateful pencil mark. As I work on the finished illustrations for A BED FOR LITTLE CUB I keep telling myself two things: 1) if I make a mistake I can always start over (this never really seems to work to give me courage to plunge in and just start drawing) and 2) it’s only a 12″ x 12″ piece of paper that you have to make magic happen on! Another trick I keep telling myself is: “Oh, just start drawing, have fun with it, it’s only a sketch.” This little mind trick is what I try when I’m actually working on a finished illustration. Sometimes it works, sometimes it doesn’t. There’s always that wretched little creature on my shoulder, whispering in my ear, Doubt. MY feeling exactly! I love to draw, but there is something very intimidating about doing a drawing, making an illustration that is going to be published for all the world to see and make note of any missteps you make. I have to get these seventeen illustrations finished and I feel like I’m slogging away through a tub of molasses and not making very much progress! I know what I want to draw and I wish I could draw faster and paint faster. But, it feels like an interminable painstaking process. It’s not illustrator’s block (or is it). It’s simple avoidance. I force myself to sit at the drawing board in the studio willing “magic” to happen and not letting myself get out of my chair until it does. Work in the studio is coming along nicely! I am excited about the work that I am accomplishing in the studio as I work on the finished layouts and finished artwork for A BED FOR LITTLE CUB! I’m not doing any writing at the moment because I have to get 17 finished illustrations done by the end of August. Then back to writing (and still drawing). I am very pleased with this sketch. 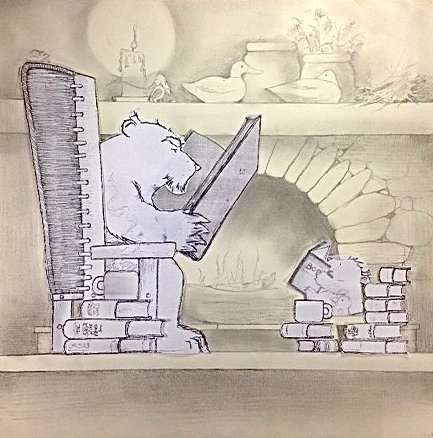 I have to decide if the second mouse should be perched on top of Old Bear’s chair or quietly sitting on the edge of the hearth behind his chair. The duck decoys work beautifully in this picture and I’m so glad that idea came to me before I did the final drawing and painting of this illustration. It is easy to see how the composition has greatly improved since this very early sketch/layout. It’s a lawn mowing day here in the mountains. The sound of lawn mowers surround Henwoodie as everyone seems to be out mowing their lawns. I mowed ours a couple days ago. Other than the sound of the mowers, birds are chirping and the air hangs heavy over the trees. The sun is trying to come out, but it’s one of those uncertain end-of-summer days. I worked in the studio until 7 am. 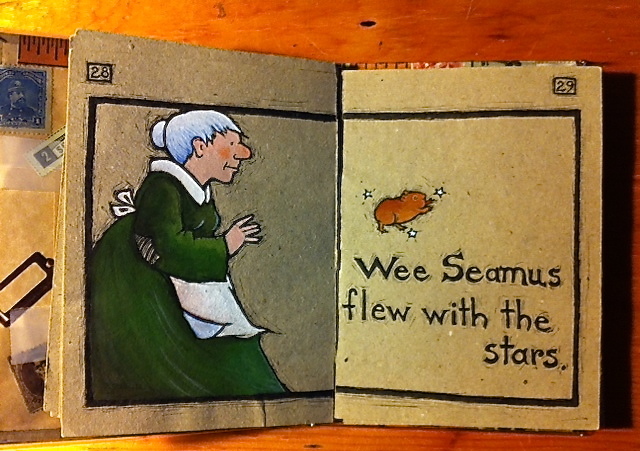 I am making progress with the finished illustrations for A BED FOR LITTLE CUB. Ideas come at the oddest moments. Around 3 am the idea came to me to put old, rustic duck decoys and carved ducks on the mantle of the fireplace in the two illustrations that feature the stone fireplace as the central background element. The ducks will add a touch of specific quirkiness to the lives of Old Bear and Little Cub (they certainly are NOT duck hunters!). I like the shape of the duck decoys and the earthy colours that I can show in the pictures. 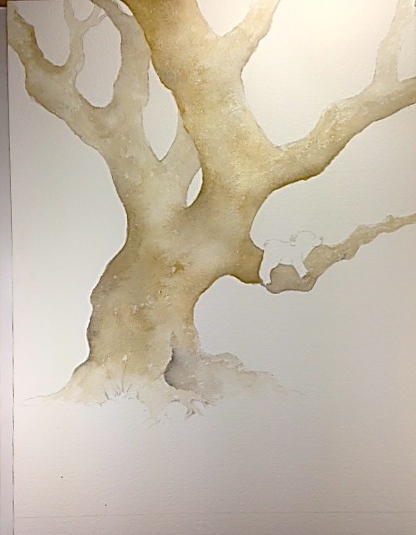 I threw caution to the wind and went ahead and started painted the entire tree that shows Little Cub sleeping on a bowed lower branch. 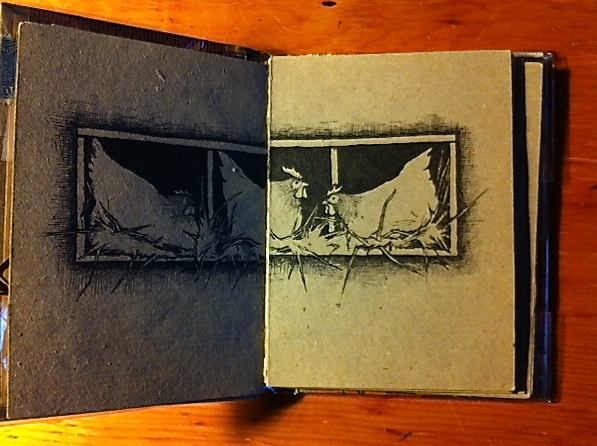 The picture will be cropped to fit the 10″x10″ trim size of the book (and most likely reduced a bit). This picture will be used on the half title page. My thought is that it makes a nice lead-in to the idea that Little Cub wants his own bed to sleep in. This jpg shows the first layers of underpainting.